We have so much going on in December, especially our December Art Workshops. Please don’t miss out on all of our upcoming events, classes, and fun. If you need details or directions or information on contests/activities call Jeni or Richard at TSG on Monday. Don’t worry if you work mornings and days, we offer afternoon and evening sessions. 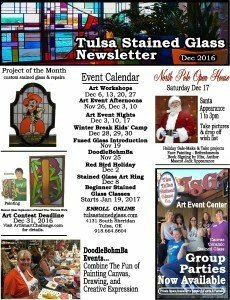 Specific dates are on the event calendar on AEC home page, general info is on Meetup in the Tulsa Art Events group. Also sign up for our courses, classes, and fun at Eventbrite. We have daily, weekly, & monthly projects, one-day projects and projects that last over several weeks! We promise we have something for everybody. Don’t you people do Stained Glass? Absolutely! Our Stained Glass Company does residential, religious, and commercial stained glass and has since 1975. Out of that business has come Doodle Bohm Ba, the Art Event Center that hosts all of our great art events from canvas to ceramics, & The Art Smart Challenge. Without our Stained Glass success, none of these other things would be possible, so we are thankful Tulsa County that you have chosen us as the your Stained Glass provider over the last 40+ years.